Pastor Tim Waits has been serving the Rock Run congregation since 2003. He is married to Delia Miller Waits, and they have two grown daughters, Carrie and Emily. 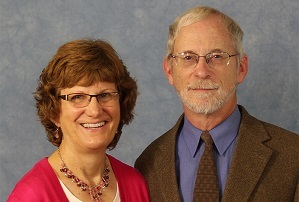 Tim and Delia both graduated from Bethany Seminary in the 1980’s. Tim grew up in southern Ohio, and graduated with a degree in Agriculture from Berea College in Berea, KY.
Tim likes to play guitar, hike in the woods, fly kites, work on old cars, grow flowers, and eat pie. Delia is a social worker and Admissions Coordinator at Greencroft Healthcare in Goshen. She completed her Master of Social Work degree at Western Michigan University in 2002. She did her undergraduate work at Manchester College and the University of Wisconsin at Green Bay. She also has a degree in Peace Studies from Bethany Seminary, where she and Tim met.